I have just discovered that April 23 is the International Day of the Book. This is even more worrying than the daily emails that arrive declaring the end of the printed book, the percentage of new novels being bought solely as ebooks, the number of people using Kindles, the number of books bought on Amazon, the heroic small booksellers sending out distress signals to their customers asking everyone to please buy a book otherwise they might be forced to close. This is worrying because International Days are usually for things under threat of extinction, like Peace or Whales. I am not sure whether to hang out the balloons and the bunting on April 23 or celebrate the day more quietly by bookselling as usual in the spirit of the wartime poster, Keep Calm and Carry On. The shortlist is announced today - we tried to predict what it would be and got it half right... Room, Emma Donoghue; The Tiger's Wife, Tea Obreht; Great House, Nicole Krauss; Grace Williams Says it Loud, Emma Henderson; The Memory of Love, Aminatta Forna ; Annabel, Kathleen Winter. Quite strange that A Visit From the Goon Squad wasn't on the list, as it recently won the National Book Award in America. Of the ones I have read, I think Room should win. It is very well written and quite brilliant. But I must read the others too. 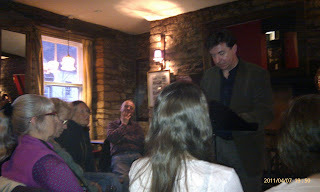 We had a very good evening as you might be able to tell from the photos taken by Kathryn from Tower Poetry on her mobile. 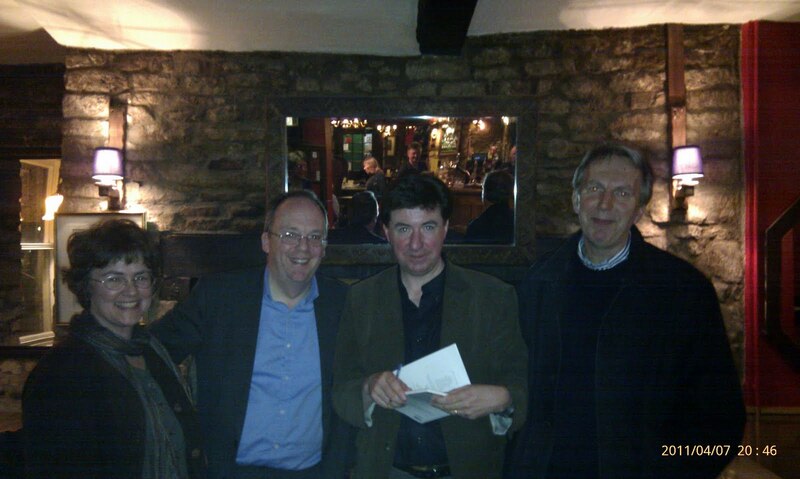 The top one shows, left to right, me, Peter McDonald, David Morley and Stephen Franks (a customer and member of the audience) and the bottom one shows David Morley reading. Peter and David had spent the day judging entries for the Tower Poetry prize, a prize for 16-18 year olds. It was great that they were able to come on and read to us - do look out for their poems if you haven't come across them before - Enchantment, by David Morley and Torchlight by Peter McDonald.